Do you love working with animals? Well here is your chance! We are overflowing with puppies at the Shelter and are in desperate need of dedicated and passionate volunteers. 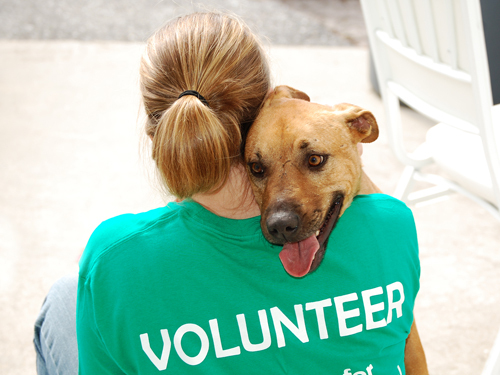 Our volunteers assist the Animal Care staff with feeding, cleaning and caring of the Shelter animals. Shift times and duration are flexible – there is no commitment necessary. The Shelter is open Monday to Friday from 11:00 am to 7:00 pm and Saturday from 11:00 am to 6:00 pm. Once the Volunteer Application and Waiver forms are signed, volunteers may come in as early as 9:00 am. Volunteers must be at least 14 years of age and have a genuine love of animals, enjoy spending time with dogs and cats and not be afraid of getting dirty! For volunteers 18 years of age and older, we welcome Dog Walkers anytime. If you have experience handling and moving dogs and enjoy getting fresh air, our dogs love the exercise! Anyone interested in volunteering at the Shelter is encouraged to come in, meet us and fill out a Volunteer Application form and Waiver. These forms must be signed before any volunteer shifts are begun. If under 18 years of age, please have a parent or guardian come in to sign the form as well.